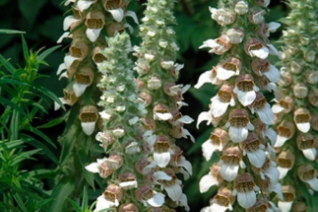 The so called Chocolate Foxglove gets its moniker from the soft brown tubular flowers that densely line the stalks. They tower up to 4′-5′ when happy. 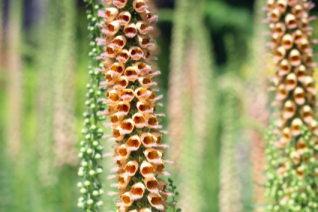 A perennial foxglove with amazing architectural bloom spires. That remain effective for weeks. Full sun and rich, well drained soil. Regular summer water which can often lead to re-bloom. Nice corrugated foliage lined in fine white hairs. Strong deer resistance. The textures and combinations that this offers are mind boggling. What great luck. 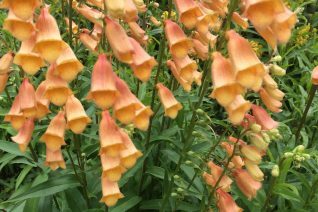 The bees were busy in our nursery years ago and they crossed a shrubby species of Digitalis with a tetraploid herbaceous species. What we got was a fantastic incredibly long blooming and tough perennial with exquisitely honey colored flowers. Remove spent spikes in June and more will likely appear. Sterile and very likely a tetraploid. 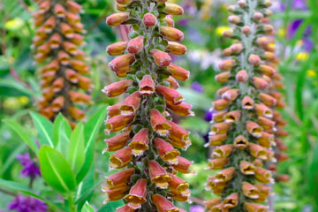 Each clumping plant creates multiple 3′ spikes of flowers- up to 15 spikes per plant! Blooms April-June and sporadically after that. 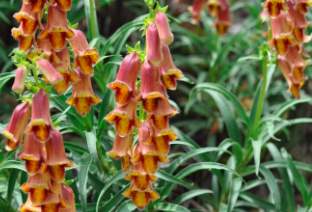 Forms semi-evergreen clumps in FULL SUN and rich to average well drained soil. Completely deer resistant. Light summer water requirements.